UPSSSC Group C Recruitment 2018 Uttar Pradesh Adhinasth Sewa Chayan Ayog will fill Gorakhpur Universities Group c vacancies which are estimated to cross above 100. So there is chance of Office Assistant, Junior Clerk, Receptionists, Librarian and other Non Teaching Staff. 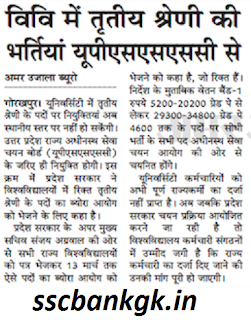 New Government of Uttar Pradesh already said fill posts on Surf excel basis and State Regulatory Universities Group-C Class-III Advertisement already given in press. 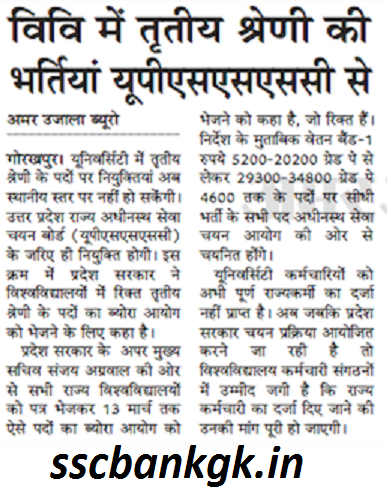 UP SSC Group C Recruitment 2018:- Thanks to press release in Local newspaper we time to time published upcoming opportunities for that aspirant who daily search and make their qualification according to UP State Govt Jobs. Gorakhpur University has handed over Group 3 liability and has asked the government to soon give noc and passed the reasonable amount for going through. UPSSSC Group C Vacancies 2018:- Uttar Pradesh Subordinate Services Selection Commission said Gorakhpur Group C candidates they will be counted as State Govt level employees. 1. Name of the Post: - Junior Assistant, Office Assistant, Computer Operator, Librarian, Instructor, Peon, Mali, Attendant etc. I. 12TH pass or equivalent from a recognized Board or University. iii. Dictation: 10 mts @ 80 w.p.m Transcription: 50 mts (Eng) 65 mts (Hindi) (On computer). 7. Selection Process: - 100% direct recruitment. 8. Age limit: - Minimum 18 to 27 years. Age relaxation 5 for SC/ST and Women categories as applicable under Govt. of India rules would be applicable.